Donald Trump has voiced strong, and sometimes conflicting, opinions on the United States’ role in Syria, even before he became president. Chemical weapons inspectors collected samples from Syria's Douma on Saturday, two weeks after a suspected gas attack there followed by retaliatory strikes by Western powers on the Syrian government's chemical facilities. The site visit, confirmed by the Organization of the Prohibition of Chemical Weapons, would allow the agency to proceed with an independent investigation to determine what chemicals, if any, were used in the April 7 attack that medical workers said killed more than 40 people. Douma was the final target of the government's sweeping campaign to seize back control of the eastern Ghouta suburbs of Damascus from rebels after seven years of revolt. Militants gave up the town days after the alleged attack. The U.S., France, and Britain blamed the President Bashar Assad's government for the attack, and struck suspected Syrian chemical weapons facilities one week later. Pentagon spokeswoman Dana White confirmed that, as President Donald Trump tweeted, the U.S. airstrikes in Syria were "mission accomplished." The Syrian government and its ally Russia denied responsibility for the attack. OPCW inspectors arrived in Damascus just hours before the April 15 strikes but were delayed from visiting the site until Saturday, leading Western officials and Syrian activists to accuse Russia and the Syrian government of staging a cover-up. "I won't find any hope in my heart until the Assad regime is held accountable and eradicated from government in Syria," said Bilal Abou Salah, a Douma media activist who left the town after the government takeover. He said he feared Russian and Syrian government personnel destroyed potential evidence in the two weeks since the alleged attack. The OPCW said in a statement that it visited "one of the sites" in Douma to collect samples for analysis at agency-designated laboratories, adding it would "consider future steps including another possible visit to Douma." It said the mission will draft a report based on the findings, "as well other information and materials collected by the team." The OPCW mission is not mandated to apportion to blame for the attack. President Donald Trump said Friday the United States has “launched precision strikes” on targets associated with Syrian chemical weapons program. He said a “combined operation” with France and the United Kingdom is underway. A U.N. security team had scouted Douma on Tuesday to see if it was safe for weapons inspectors to visit. The team came under small arms and explosives fire, leading the agency to delay its mission. Journalists visiting Douma the previous day, escorted by government minders, experienced no security issues. Russian ministry spokeswoman Maria Zakharova said the delays to the OPCW team were "unacceptable," in a statement Saturday. Douma is just minutes away from Damascus, where the OPCW team is based. Images emerging from Douma in the hours after the attack showed lifeless bodies collapsed in crowded rooms, some with foam around their noses and mouths. Abou Salah entered one of the buildings affected by the alleged gas attack the following day and took footage of a yellow cylinder with a gas valve on the top floor. He said it had crashed through the roof and showed a gash in the ceiling where it purportedly came through. 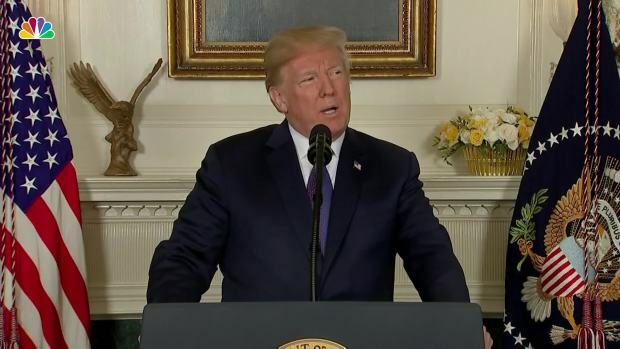 President Donald Trump condemned a recent apparent gas attack that killed dozens of Syrian civilians, including civilians. His assertions could not be independently verified. But the cylinder looked like others identified by the international NGO Human Rights Watch at other locations of chlorine gas attacks attributed to the government in 2016. Raed Saleh, the head of the Syrian Civil Defense search-and-rescue group, also known as the White Helmets, told The Associated Press on Wednesday that his organization had shared the coordinates of the graves of April 7 victims with the OPCW, so that inspectors could take biological samples. Civil Defense workers evacuated Douma after the attack, fearing persecution by the security services of the government. The government says the group is a terrorist organization. The group, which operates in opposition areas only, maintains a strong position against Assad. Thousands of people — rebels and civilians — left Douma on buses to north Syria in the days after the attack, believing they could not live under government authority after it retook the town. North Syria is divided between opposition, Turkish, and al-Qaida control. The evacuations were the latest in a string of population transfers around the Syrian capital that have displaced more than 60,000 people as the government reconsolidates control after seven years of civil war. U.N. officials and human rights groups say the evacuations amount to a forced population displacement that may be a war crime. On Saturday, rebels began evacuating three towns in the eastern Qalamoun region in the Damascus countryside, state TV reported. State-run Al-Ikhbariya TV said 35 buses left the towns of Ruhaiba, Jayroud, and al-Nasriya carrying hundreds of rebels and their families to opposition territory in north Syria. The station said there could be 3,200 rebels leaving three towns on Saturday. It said the evacuations would continue for three days. Syrian government forces will take over the towns once the departures are complete.